Fix A Leak Week 2017 | Carroll Plumbing & Heating Inc. The average household’s leaks result in more than 10,000 gallons of water wasted each year. That’s roughly the same amount of water needed to wash 270 loads of laundry. 10% of homes have leaks that waste 90 gallons or more per day. Common types of leaks found in the home include worn toilet flappers, dripping faucets, and other leaking valves. All of these are easily fixed. In fact, fixing easily corrected household water leaks can save homeowners up to 10 percent on their water bills. Keep your home leak-free by repairing dripping faucets, toilet flappers, and showerheads. 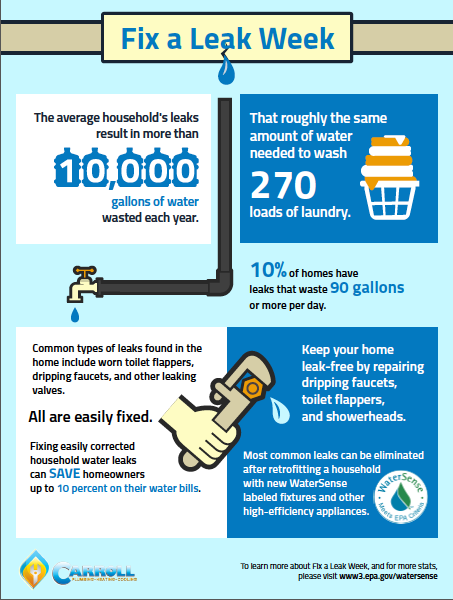 Most common leaks can be eliminated after retrofitting a household with new WaterSense labeled fixture and other high-efficiency appliances.